Thanks to the “New Year’s” initiatives of Kim Jong-un – to which South Korean Moon Jae-in responded for his own reasons – significant progress was made in the inter-Korean dialogue at the highest level during the recent Winter Olympics in Pyeongchang (the possibility of an inter-Korean summit is even on the table), although the main achievements thus far have been in terms of good PR rather than concrete agreements. That being said, the possibility of reducing the threat of an all-out war on the Korean Peninsula, and of an eventual reconciliation of the two countries, is now closer than ever before. However, this process makes the denuclearization of North Korea an impossibility. In fact, it does quite the opposite, effectively acknowledging Pyongyang’s status as a nuclear power. The North will not discuss the nuclear process with the South, as Seoul cannot provide any security guarantees. The only country that can is the United States, but Washington is not looking for compromises. The United States sees negotiations with North Korea purely as a discussion of the terms of Pyongyang’s capitulation and the surrender of its nuclear trump card. Put simply, North Korea, as a country that has spent generations building its international identity and influence on the basis of its nuclear weapons and which uses nuclear weapons as a guarantee of its security, has no plans to do this. The last thing Washington wants is a rapprochement between North and South Korea, as this would hamper its immediate goal of eliminating the nuclear potential of North Korea (as well as the longer term objective of toppling the entire regime). What is more, the reconciliation of North and South Korea could be interpreted as a reduction of the military threat in its own right. In this case, the United States would have fewer opportunities to build up its military potential in Asia, which is directly primarily against China. For this reason, the United States does not want to allow “liberties” on the part of its junior partner in the union. Donald Trump is actively and unambiguously against a détente and is keen to step up the pressure as much as possible, including “twisting the arms” of his allies and partners if doing so serves his purposes. Washington is not limiting itself to demanding compliance with the sanctions agreed within the framework of the United Nations. With a view to weakening the North Korean regime, Washington is trying to ensure that the draconian sanctions imposed unilaterally by the United States are supported by other countries, the tacit threat being that repressive measures will be employed against dissenters. This is a shameless use of pressure, the likes of which we have not seen in modern history. Russia and China are in a particularly vulnerable position and are accused, often without grounds, of violating the sanctions. From their perspective, these are demands to comply with the plans of the United States to implement a blockade on North Korea and suffocate the country’s regime though financial and economic means. The hopes harboured by the United States that events will develop in this way are based on a lack of understanding of the North Korean reality, a projection of its own ideas about how the economy and society should function. There is no way that a blockade will force North Korea to abandon its nuclear programme wholesale, although such a measure could make the country more acquiescent in terms of restrictions and monitoring activities. But such a scenario is unacceptable for the United States, as it is the recognition of North Korea’s nuclear status. Donald Trump hopes to intimidate North Korea with demonstrative military preparations and a public discussion of a possible armed conflict. Such provocations are likely to intensify after the “Olympic truce,” particularly against the background of joint US–South Korea military manoeuvres, which will quite rightly cause concern in the North. Although these manoeuvres should probably not be seen as a dress rehearsal for a future invasion; everyone understands the scale of the disaster that would befall the region if this were to happen, especially considering the nuclear potential of both North Korea and the United States. The danger is that, even if Trump is bluffing and has no intention of actually starting a war, his allies and enemies (and even his subordinates, in order for Trump to get what he wants) have to take these plans seriously. But such a policy could lead to the American military machine inadvertently falling into the abyss of a “limited” and then all-out global war by accident, oversight or fatal confluence of circumstances. It is entirely possible that the United States will increase pressure on North Korea after the Olympics in order to anger the country’s leadership and provoke it into a sharp reaction, for example carrying out further nuclear tests. Pyongyang is likely more than ready to perform more tests, and has the technical need to do so (for submarine-based missiles, for example). Even if Pyongyang cannot be coaxed into starting a war, the United States may artificially create the necessary circumstances by engineering a casus belli situation (which was the case with the Gulf of Tonkin incident). It must be recalled that China and Russia are being blackmailed with the possibility of a military catastrophe, which would help the United States pursue several goals at once. First, to try and force Moscow and Beijing to take more decisive measures against Pyongyang (perhaps even with a view to changing the North Korean leadership). Second, to put China (and Russia, although its stakes in this particular game are not as high) in an uncomfortable position, no matter how events unfold. Continued support of Pyongyang would undermine China’s image around the world, and not only in the eyes of pro-American countries. On the other hand, if China “abandons” North Korea at the insistence of the United States, then its reputation among friendly and undecided states will be seriously damaged. The latter will see China as a country that cannot be trusted or counted upon, and the United States will continue to be regarded as “global hegemon”. The United States will use Russia’s supposed violations and unwillingness to cooperate to discredit the country’s leadership. It would appear that Russian diplomacy must be deployed as a countermeasure in several areas, including jointly with China. First, strengthening coordinated actions between Russia and China on the Korean issue, including in their relations with third countries and international organizations, particularly the UN. 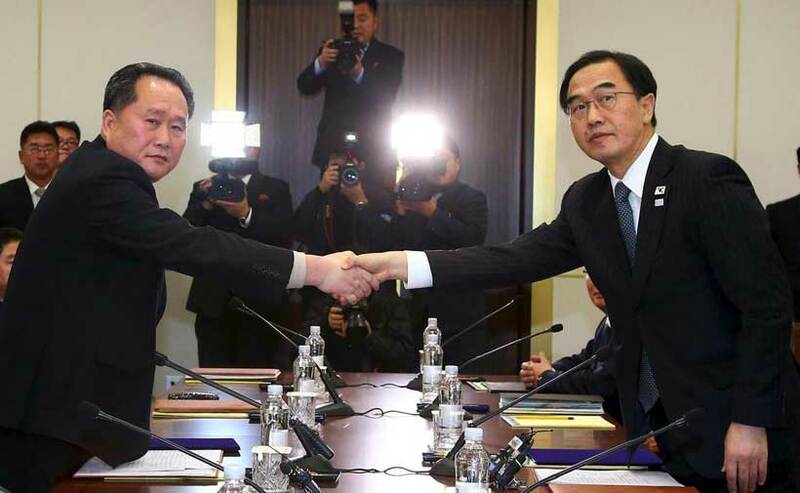 Second, intensifying contacts with Pyongyang in order to develop a unified course of action with other players and persuade North Korea to act with greater patience and flexibility (Track II, or informal, diplomacy is also important here). Third, applying consistent and well-thought-out pressure on Washington to abandon its aggressive plans, and explaining that going through with these plans would violate Russia’s national interests and provoke an appropriate response. Fourth, carrying out persistent work and developing cooperation with the North Korean leadership in order to encourage a warming of relations between the North and the South and avoid excessive concessions to the United States that would go against the logic of a rapprochement. Fifth, concretizing and refining (step-by-step) joint proposals put forward by Russia and China on the development of a “road map” and actively promoting it in contacts with all partners and international organizations, including promoting the concept of six-party talks.